Dogs Rule. And I’m Staff. Kidding. I’d be the first to say you have to be in charge. Dogs need a leader and will accept the post if you abdicate. Not a good idea. However, I still do the work, of course. It’s more noticeable as they age. And I’m really torn between encouraging people to adopt an older dog and being up front about the difficulties of looking after the really old ones with their health challenges. Having said that, please consider adopting an older dog. Puppies will get homes. I worry about the ones that have had a difficult life or maybe a good life that ended suddenly with the owner in a seniors’ home and them in a cage, innocently wondering what happened. The real heroes here are Jesse, Bougie and Nicholas. Dogs ask for so little and give so much. I’m hoping, with your help, we’ll learn together to benefit our wonderful companion animals. He arrived with a flurry. Because Jesse enjoyed all dogs, I had decided to find another one and learned that Nick's owner was giving him up. 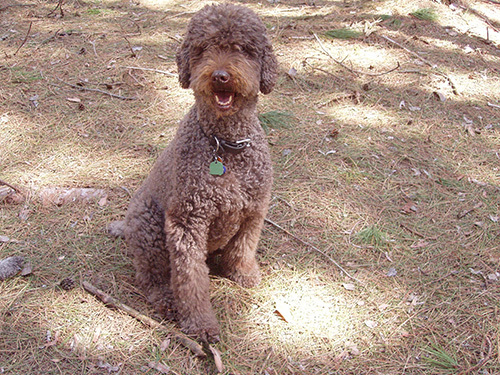 I knew he was a standard poodle but was surprised when this lively two-year-old chocolate poodle barged through the door. He checked out the whole house and I got my first glimpse of his enthusiasm for life and his curiosity of just about everything. Nicholas didn't play with dogs (he loved toys, though) but he and Jesse compromised with the "chase" game and it was a part of their every day until they slowed down with age. Nick is now an old guy but is still curious, still enjoys his toys and has a good appetite. 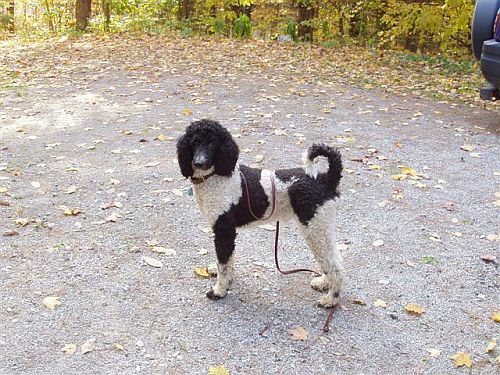 He was always rather full of himself and liked to take charge of situations, especially where other dogs were involved. Unlike Jesse, he seemed emotionally and physically vulnerable. He feared thunder storms and suffered from separation anxiety. He had more trouble with mobility than the other two. But he has courage and is persistent and I believe his undying curiosity keeps him going. I was certain he would be the first to go - not only because he was the oldest but mostly because he seemed less sturdy. You just can never predict life, can you? Nicholas collapsed on New Year's Eve, 2011. and we've been nursing him back. He's started back on his feet again with the help of a leg brace. He's a great dog, aging with grace and dignity under very undignified conditions. Nicholas's heart stopped beating around noon on July 1, 2012. No more furry head to tousle. Just memories now. Overwhelmed with sadness at the moment. She was my first dog. She had the perfect happy personality. I never saw her surly. Correction, only when Nicholas tried to hump her. Good girl. Occasionally when Jesse was hungry and I wasn't too responsive, she'd poke me with her nose. I'd ask, "Are you hungry? and she'd enthusiastically stretch out her leg and tap me with her paw. That told me "Yes". Then she'd lie down by the kitchen and contentedly watch me prepare her dinner, twisting her head side to side while I talked to her. She loved food, people and, most importantly, other dogs. My son called her the Social Convener as she welcomed all visiting dogs and displayed pure pleasure in her job. Jesse in 2008. 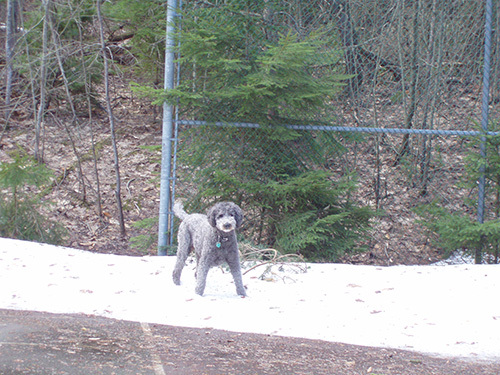 She loved the last patch of snow on the court. Jesse wasn't excitable, which allowed her to problem solve easily. One day we were walking up a sidewalk in Toronto. Nicholas was on the wrong side of an adjacent fence. 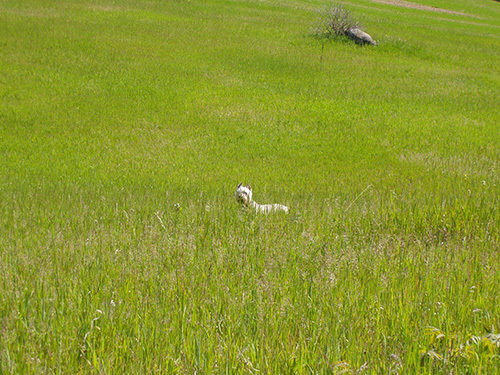 We thought there was a gate at the top of the field so kept on walking. Turned out there was no way to exit, so we motioned to Nick to go back around. He was too anxious to understand and just stood there barking. Jesse got it, though. She walked up to him, touched noses through the fence and started walking him down it from our side. About halfway there, Nick figured it out and tore down and back up to join us. Jesse was a sturdy girl – emotionally and physically. She wasn't excitable. She was calm during storms. Her demeanor extended to wild animals. I watched her one day as she stood and stared at a squirrel about four feet away from her. The squirrel stared back, I guess recognizing her energy wasn't to harm. Another time, Jesse stood very close to a porcupine and watched him walk across the driveway. (Nick, on the other hand, got a mouthful of quills the first weekend I had him.) I adored that and everything else about her. I'd known her since she was a pup. And I've loved her that long, too. She came to visit on holidays each year and we got to enjoy her sunny disposition, her lumbering Bouvier gait, and her enthusiasm for new (to her) food. In later years, Bougie, like Jesse, held back on the walks she used to love. I guess age hurt. Bougie came for Thanksgiving, 2010, and stayed. I had the time to spend with her. She had been throwing up and suffering diarrhea daily. I put her on a chicken, barley and vegetable diet. The diarrhea and vomiting stopped immediately. Wraygan bathed and clipped her and she looked beautiful again. Bougie came at a good time for Nicholas. They'd never particularly liked each other but age mellowed them both and they were content in each other's company. I loved Bougie's greeting when I'd return from shopping. Her whole body, especially her stubby little tail, were in constant motion. She had lost her bark but one day after she'd been here awhile, she woofed. I was excited and shouted, "Bougie, you barked!" She woofed again and I woofed back. She was loving it and would have kept it up as long as I would. We had ten months with this wonderful dog – nine of them were good ones but at the end, she became sick. Bougie is buried next to Jesse under the apple trees. We will always love and remember her.